After trying to read up more on random effects ANOVA, I started to get the impression that linear mixed effects models (with the lmer) package are preferred over random effects ANOVA, although I have yet to see a clear distinction between the two. This leads to my first question: Which approach is best for modeling my data? If it involves using the random effects ANOVA, I would greatly appreciate it if someone could recommend a resource for the process of interpreting the results. My second question is, if the better approach is to use the mixed effects models, which I have tried, why do I get striping in my residuals? One guide suggested that I am dealing with categorical data, which requires the use of logistic regression. However, the dependent variable for my data is continuous, and the IV is categorical, which I thought LMM are supposed to handle. This leads to my second question - does my residual plot indicate something is wrong with the way I have modeled my data? Browse other questions tagged r mixed-model or ask your own question. 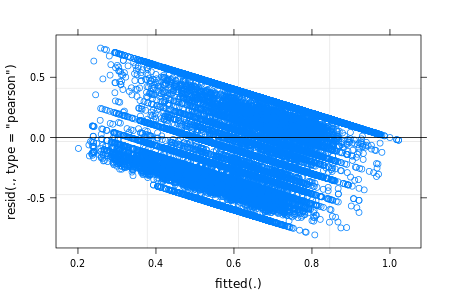 A mixture of mixed-model regression and fixed-effects-only regression: what is it exactly? Repeated measures anova or linear mixed model?